Both the U.S. Forest Service and the National Park Service have been quietly working away at several new road plans that will allow recreational access between Stehekin Valley Road and the Cascade River Road, as well as a connection from US 20 into Canada by way of the Ross Lake National Recreation Area. Photo: A view of Ross Lake looking south. For decades it has been possible for hikers to hike between these two roads using Cascade Pass. But access to the pass is too steep and two unstable to support anything other than light foot travel. National Park Service ranger Mitch McCoy has found a way around it. Several years ago McCoy worked a number of months in the region following local area elk migrations. According to McCoy, the Elk had trouble crossing over the Cascade Pass and instead traveled north over Park Creek Pass to enter onto the western slopes of North Cascades National Park. That's when McCoy got the idea it might actually be possible to give recreational access between the west and east side of the park. "National Parks are not to be enjoyed by just hikers and campers. There are many handicapped people who come to them as well and we need to provide more access to these areas so they can enjoy the depth our National Parks have to offer," said McCoy in an exclusive phone interview in late March. "The fact that anyone with a car or a motorcycle will be able to ride over Park Creek Pass is a bonus for all! It's a win-win all the way around." 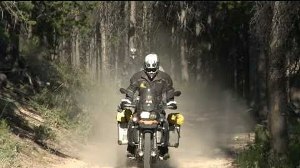 Photo - Mitch McCoy rides along a new section of road that was previously a trail leading to Park Creek Pass. The permitting process has already begun and a dirt road is scheduled to be completed by 2015. Imagine a scenic byway that cuts right through the heart of the Cascades into Canada. David Comstock did. As a ranger for the U.S. Forest Service since the late 1970s, Comstock has spent many hours in the western reaches of the Okanogan National Forest in the area that butts up against the Ross Lake National Recreation Area. He'd long dreamed of creating a route from Harts Pass into Canada but again, the ground was too loose and unstable to support such a road. Then he reviewed the border-line between the Okanogan NF and Ross Lake and realized a single-lane paved road could be accommodated following along the east side of the line beginning at Baby Creek on US 20 and following north to the Hozomeen Ranger Station just south of the Canadian border where the Skagit River flows into Ross Lake. 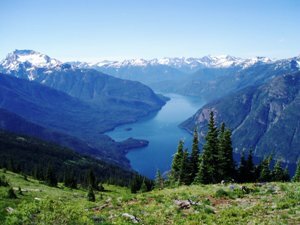 Along the route, travelers will see plenty of Ross Lake, but will also be treated to mountain tops such as Jack Mountain, Spratt Mountain and Skagit Peak. But the royal jewel in the crown of this ride will be winding one's way to the top of Hozomeen Mountain with an elevation of 8,080 feet. Prior to that, the highest peak in Washington state that anyone could ride or drive to was Slate Peak ending at 7,000 feet. Funding for the project was made possible through a US DOT grant from a fund especially designed to accommodate like requests from both National Recreational and National Forest groups inside the government. Comstock could not be happier. "To see this go from fantasy to reality in my lifetime is really special to me," he said during a call into the ranger station at Early Winters. Entering into Canada will not add any potential burden to the budget since there's already a border crossing both ways at International Point. Because this road will carry a scenic byway designation, it gets the fast track on permitting and construction. If the weather is in favor, engineers expect the road to be completed by the summer of 2014. For obvious reasons, due to elevation, the road will see seasonal closures. For free maps of both the road plans and artists renditions of the viewpoints along each route click here.